For some unexplainable reason, I’ve always adored umbrellas and parasols. 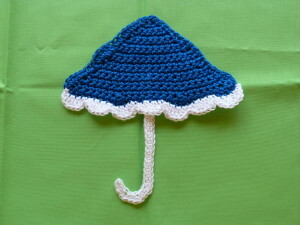 When I was little, I received a child-sized blue umbrella complete with frills. I couldn’t wait for rainy day after that. Today I find it very interesting when going out in the rain the many styles and colors of umbrellas you will see. This interest inspired this weeks pattern. It’s basic and fun to make. Make sure and tell me what you will do with yours! Gauge Swatch: 1″w x 1″h ( 2.5 cm x 2.5 cm) ch 6. With a yarn needle, sew handle to back of canopy. This was fun to make for me and I hope you will thinks so too. If you have any questions, leave them in the comments below and I’ll get back with you as soon as possible! This entry was posted on Friday, March 28th, 2014 at 9:10 AM by Amy	and is filed under Free Crochet Patterns. You can follow any responses to this entry through the RSS 2.0 feed. You can skip to the end and leave a response. Pinging is currently not allowed. That parasol is adorable – the colour combinations are limitless. This is going to have to go on my to do list. This is really cute. I will make several of them and put them on different items I made for my newest grand-daughter..Thanks for the pattern. Just love it.